Refrigerators, electric stoves, microwave ovens, toaster, coffee maker, dishes, pots, pans, cutlery, etc. Inside conveniences, pillows, pillow case & fitted sheets, Gas fireplace, in some cottages Satellite T.V. Air conditioning & Propane BBQ. 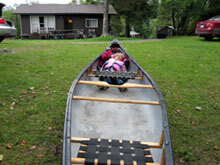 *Aluminum boat or canoe included with minimum 2 week booking. Google Map or Satellite imagery, overview map, land satellite images, map a canoe route.